AC Milan are reportedly eyeing a move for either Man Utd forward Marcus Rashford or Liverpool’s Divock Origi to bolster their attack in January. As noted by La Gazzetta dello Sport, Milan sporting director Leonardo has ruled out the possibility of Zlatan Ibrahimovic securing a return to the San Siro in the winter transfer market. With only Gonzalo Higuain and Patrick Cutrone as Gennaro Gattuso’s attacking options up front, the Italian tactician will arguably need more as the season goes on as the Rossoneri look to compete on multiple fronts, including in the Europa League. In turn, with Ibrahimovic seemingly no longer an option, Calciomercato report, via the paper edition of La Gazzetta dello Sport, that Milan have put together a three-man transfer shortlist which includes Fabio Quagliarella, Rashford and Origi. Origi would arguably be the most realistic of the two Premier League stars, with the Belgian ace being limited to just three appearances so far this season. 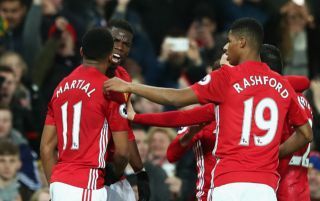 In contrast, although he hasn’t always managed to establish himself as a regular starter, Rashford has bagged three goals and five assists in 18 appearances so far this season. He seemingly remains a key figure for Jose Mourinho, and so doubts will surely be raised over Milan’s ability to prise him away from Old Trafford. With that in mind, perhaps Quagliarella will emerge as the top option, as the Sampdoria stalwart continues to impress having scored eight goals and provided five assists in just 15 outings. The 35-year-old is evidently not the long-term solution though, and so it remains to be seen if Milan prioritise a short-term fix in January or invest heavily in a long-term option.